The Official Blog for the Tulsa Drillers Baseball Club. How well do you know your Tulsa Drillers? No matter how big of a fan you are, we want to help you get to know the players that make up the Tulsa Drillers roster. What is their favorite restaurant in Tulsa? Do they have a pre-game routine? Facebook or Twitter? These are just some of the questions we will ask the players to help you get to know them. However, each player has only one minute to answer all 17 questions. Christian Friedrich was glad to be the first to sit down with us and answer all the questions in a fast paced setting. 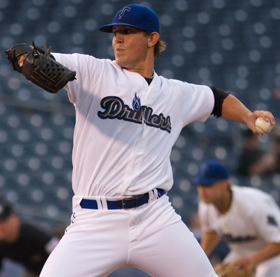 Friedrich is currently the leader of the Drillers pitching staff and ranked the number two pitcher in the Colorado Rockies farm system by Baseball America. 1. Subway, Quiznos, or Which Wich? 3. What is your favorite type of Music? 4. What is your favorite TV show? Past or Present? 5. What is your favorite sport other than baseball? 6. And who is your favorite hockey player? 7. Who was your idol when you were growing up? 9. Do you have a pre-game routine? 10. What is your favorite restaurant in Tulsa? 11. Who is the funniest Drillers teammate? 12. Most embarrassing moment while playing? 13. What is your nickname? 14. Chuck Norris or Scott Beerer? 15. Smooth or Crunchy Peanut Butter? 16. Billy Madison or Happy Gilmore? 17. Seinfeld or The Office?